The Reach Hold Guard can be found in Left Hand Mine. He guards the entrance to the mining site located on the far southern side of the small mining settlement. He stands just opposite of the smelter near the entrance. 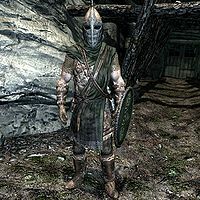 He wears the standard set of Markarth Guard's armor, including a Markarth Guard's helmet, a pair of fur boots, and a pair of fur gauntlets. He is equipped with an Imperial sword and a Markarth Guard's shield. He also carries an Imperial bow, a steel dagger, and has a 75% chance of carrying 20 steel arrows. He may also carry, albeit a small chance, an amulet of one of the Eight Divines, some inn food, and a small amount of gold. He will not be replaced by a Stormcloak Soldier if Markarth is taken by the Stormcloaks. This page was last modified on 26 January 2013, at 15:55.